Your shared connections within Teamable are used solely for the purposes of helping your company hire great people. 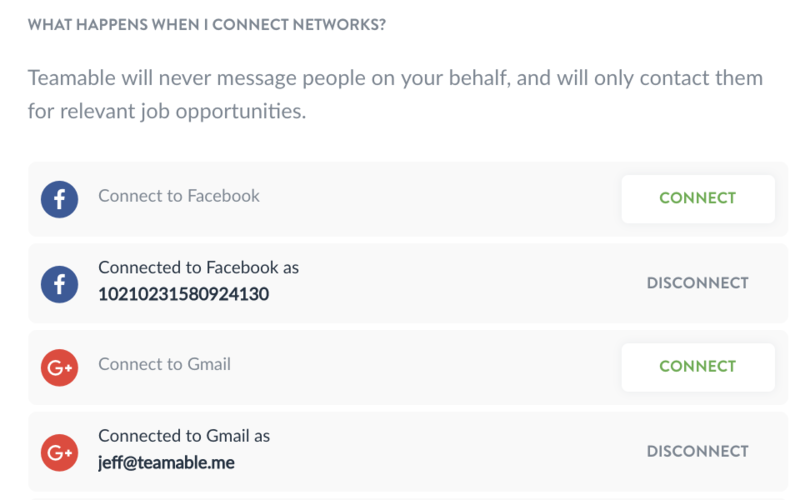 Without knowing anything about you or your online activity, Teamable will automatically match the people you know with the open jobs at your company. 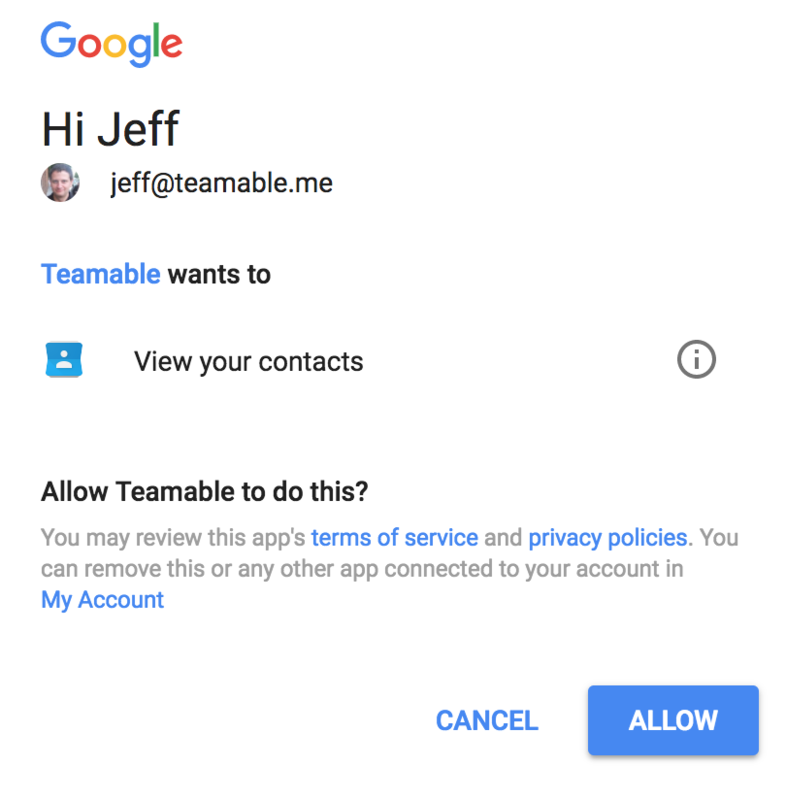 Teamable will never contact anyone or do anything on your behalf. You can also remove your networks or delete your Teamable account at any time. To add your connections, click on the Gear icon in the top right corner and choose settings. Then choose Networks. Note: the first time you create a Teamable account, you will be prompted to connect your networks. This is optional, but highly recommended. If you wish to create a Teamable account just to pass along a resume to your recruiting team, you may do so. However, most of the value for your company comes from employees participating in the company referral program by making their network connections available for the purposes of matching to the company's open jobs for the purposes of requesting warm introductions whenever there are great candidates whom you may wish to refer (you'll be helping the company and may also be eligible for a referral bonus). Click 'Connect' to connect a new network to Teamable. Click 'Disconnect' to disconnect an existing network. Note: For each network type, you can add multiple accounts. For example, if you have multiple Gmail addresses or multiple Twitter handles, you can add each of them. Adds your LinkedIn connections to your Teamable network. Permissions granted: The equivalent of address book permission to your contacts via a one-time .CSV download and upload. Adds anyone in your address book or email as a connection in your Teamable network. Permissions granted: View your contacts. Shows mutual followers as connections in your Teamable instance. Permissions granted: Read, write, and direct messages. Note: Teamable gives you the option to DM any Twitter mutual follower or Tweet about a job at your company from within Teamable. In Twitter, choose settings> apps to see and manage the Teamable Software app. Shows who you follow and people who follow you as connections in your Teamable instance. Permissions granted: Access public information (read-only). 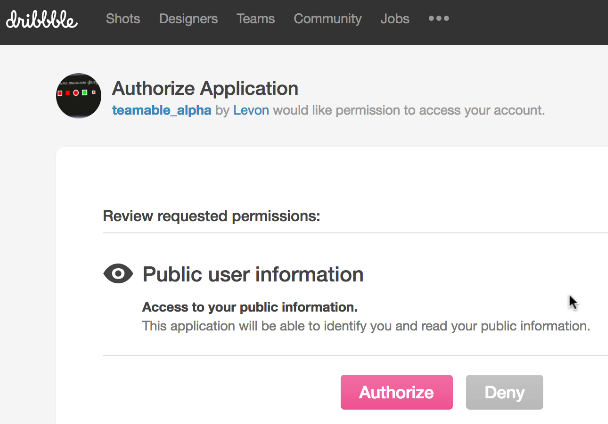 In Github, choose settings>authorized applications to see and manage the Teamable Software app. Permissions granted: Access to your public information. Note: If you wish to remove network connections or delete your account, please click here.